This is an early piece of "Nil nisi bonum de mortuis" in interpreting Louis's rôle in the charge. ('Bob', who may just possibly be his nephew Robert Macfarlane, was clearly unaware of the verbal altercation with Lucan, and of the strange circumstances of his death.) However, the quotations from Cavalry: Its History and Tactics are interesting and worth considering in the light of what happened. The biographical data is reasonably good, even if it mis-spells his first name (everyone had trouble with it!) and knocks a year off his age: he was actually in his thirty-seventh year. Re: his family, his full brothers, Archibald and Edmond, had died of fevers in the West Indies and India respectively, and all of his half-brothers had also predeceased him. The original of the portrait is a naive watercolour in the collection of the Light Dragoons. Rule 3. Never attack without keeping part of your strength in reserve. 9. Charges on a large scale should seldom be attempted against masses of all arms, unless they have previously been shaken by fire. 10. Always watch for and seize the right moment to attack. The most difficult position a cavalry officer can be placed in is in command of cavalry against cavalry; for the slightest fault committed may be punished on the spot. All these errors were made, however, under some horrible delusion. The Light Cavalry galloped, open-eyed, into destruction as complete as if they had fallen into an ambuscade. Who can doubt that if they had had to charge any reasonable number of Russian infantry or cavalry, clear of the batteries, that they would have ridden them down? As it was, they sabred the artillerymen at their guns. Captain Nolan was struck on the heart by one of the first shells, gave a loud cry, and died instantly. His horse turned and galloped back with his dead rider firm in his saddle. At the time of his death he was in his thirty-sixth year, and had shared in the battle of the Alma, as Aide-de-Camp to Brigadier-General Airy, Deputy-Quartermaster-General. He leaves a bereaved mother, a widow, who had already lost two sons in the service, to mourn the early fall of the last, who was at once her only pride and hope. The accompanying Portrait is from a picture painted in India. Poor Lewis Nolan has gone to his rest. 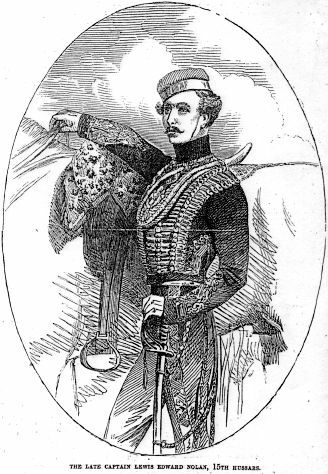 In a cavalry action three days ago he bore an order from Lord Raglan to Lord Lucan to charge a battery of heavy field-pieces, and in the act of delivering it, a piece of shell struck him on the left breast, and passed through his body. Death, by the mercy of Heaven, was instantaneous. Poor Lewis! he was a gallant soul. The day before his death, I am glad to think, I met him, and he said, "Well, Bob, is not this fun? I think it is the most glorious life a man could lead." Few men of his years promised to be such an ornament to his profession. I am sorry to say, now that he is gone, some people here say that in the heat of the moment, poor Lewis gave Lord Lucan a wrong order. Such is not the case. The order was a written one, and therefore the mistake was not on his side.